We have these roast in our freezer. HUGE chunks of meat I have no idea what to do with. I am not a “roast” fan. The hours of cooking so the fat can melt and seep into the meat, just does not appeal to me. I have never liked the texture of roast and one day while flipping through channels I paused on America’s Test Kitchen (love that show, especially back in the day when it hadn’t yet been “glammed up”). They were cooking a roast. One reason I love that show is they explain the science behind the cooking or at least the reasons why you do what you do. So they explained that the reason a roast is low cooked for hours is because the fat needs to melt into the meat. It makes it tender and flavorful. Yeah, snort! I didn’t like it before and that REALLY made it unappealing to me. But . . . . this beef is more lean, I believe. I have also grown a little bit more tolerate of roast and have actually had some that were yummy. But, cooking one? Another story. I can’t remember exactly how I came across a recipe for Cuban Beef. I wasn’t looking for it, I think I might have just happened across a blog and it was on there? I don’t remember, but I have had a recipe for Cuban Shredded Beef on my desktop for almost a month now. So I decided to try it. Well, not really. I had read through the ingredients but not the instructions. I started to read through them the night before I was going to cook the roast and I decided I didn’t want to do that. I wanted to throw the thing into my crock pot and let it cook. So, I started with her list of ingredients and went from there. I bet it would help a lot if I were more familiar with the science behind cooking a roast. You will use some of these ingredients in the crock pot and some in the oven. 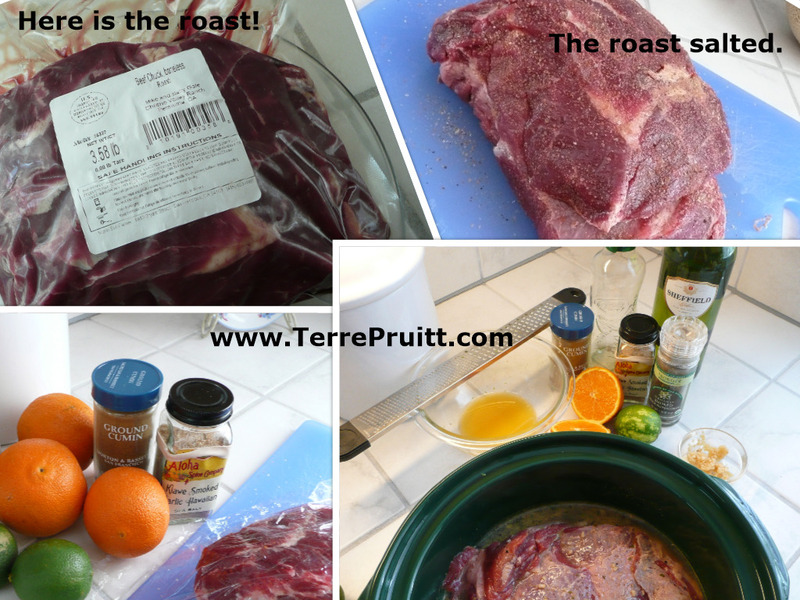 Coat the roast with salt and let it set while you prepare the crock pot liquid. Mix the above ingredients together, pour them into the crock pot, then put the salted roast in the crock pot. If the liquid does not cover the roast and you have a few minutes, let it sit, then flip it over. Then put the sliced onions on top. Let it cook on low for three hours. Then flip it over and turn it to high for an hour. Then turn the heat to low and let it cook for another two hours. **this was a grass-fed roast. Grass-fed beef tends to cook quicker so keep that in mind. Mix all the ingredients. Shred the beef (I used my blender), spread on cookie sheet, pour the liquid over the beef, stir it so all the beef can get some of the liquid. Then put the cookie sheet in the oven for 20 minutes on 425° F. You might want to cook it a bit longer if you want those crispy bits of beef. You decide. I served it on bread. A sweet submarine roll for my hubby and sliced sour dough for me. I don’t really know how you are supposed to serve Cuban Beef. I don’t know what Cuban Beef is. I just made a “regular” sandwich; cheese, mayo, and onions. I put quartered limes on our plates and we both ended up squeezing it on the meat. *I am going to use more lime in the recipe itself next time. This was very good. I like the lime flavor. It is zesty and a step away from our normal flavor palate. It was nice. I will probably do it again with one of the other roasts we have. So . . . what is “Cuban Beef”? Do you have a recipe for Cuban Beef? This entry was posted on May 30, 2015 at 8:26 pm	and is filed under "Recipes", Food. 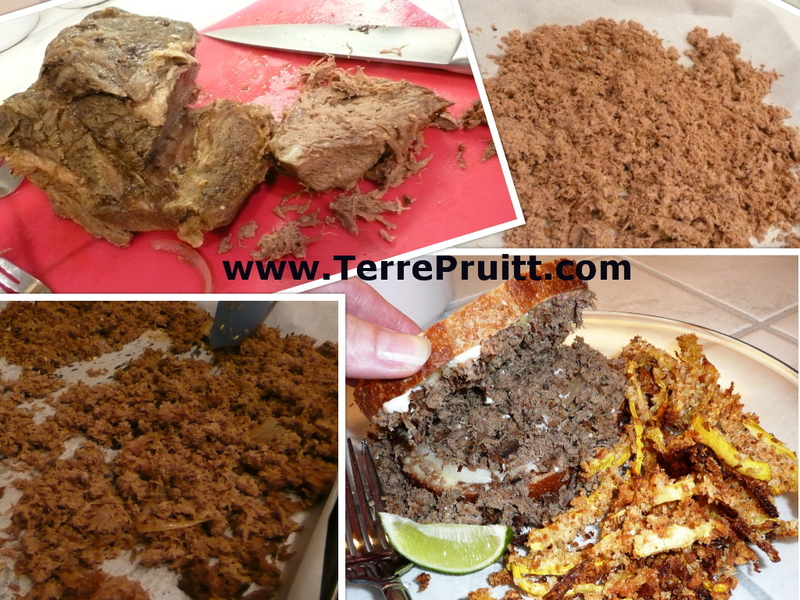 Tagged: America's Test Kitchen, crock pot recipe, Cuban Beef, dinner recipe, grass-fed beef, lime and cumin, Nia Technique, roast beef, roasts, sandwiches. You can follow any responses to this entry through the RSS 2.0 feed. You can leave a response, or trackback from your own site.